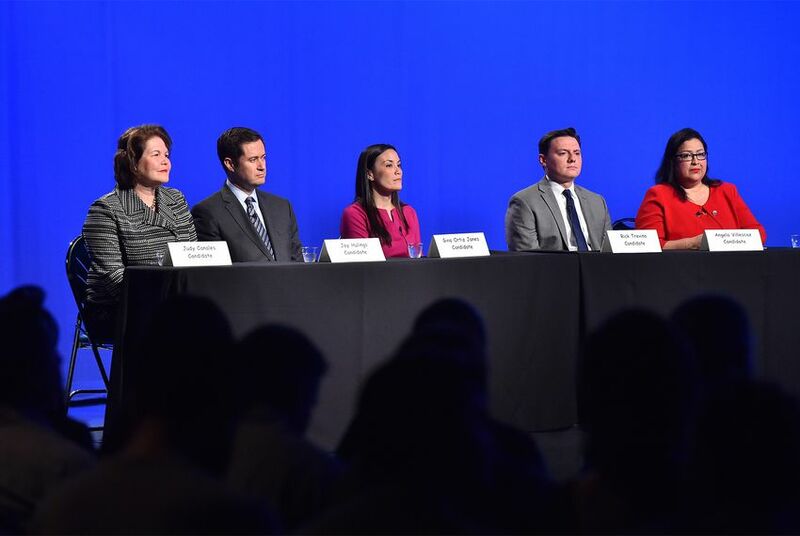 At a Tuesday forum in downtown San Antonio, the few differences that emerged between Democratic candidates vying to represent Congressional District 23 came when they tried to cast themselves as the best person to take on Republican incumbent U.S. Rep. Will Hurd. SAN ANTONIO — There’s little daylight between the five candidates in the crowded Democratic primary to represent Texas’ 23rd Congressional District when it comes to core party issues. All agree on the need for a clean vote on protections for undocumented immigrants who were brought to the country illegally as children. They all oppose a wall on the Texas-Mexico border and want to see comprehensive immigration reform. They’re supportive of reforming the health care system to provide some form of universal coverage. And they’d all like to see Congress address gun violence. But at a Tuesday forum in downtown San Antonio — with just a week to go until the primary elections — their few differences showed when they tried to cast themselves as the best person to take on Republican incumbent U.S. Rep. Will Hurd of Helotes in one of the country’s most competitive districts. San Antonians Jay Hulings, a former federal prosecutor, and Gina Ortiz Jones, a former U.S. Air Force intelligence officer, cast themselves as the most formidable candidates to chip away at Hurd’s work as a CIA agent. Hulings, touting his work on the border and in San Antonio, said he could “do to Will Hurd what no one else can,” given his work as a federal prosecutor and his time as a lawyer for the the U.S. House Intelligence Committee. A former Bill Clinton and Barack Obama appointee from Eagle Pass, Judy Canales attempted to position herself as the homegrown candidate who hails from the border. And she joined Angie Villescaz in touting that one of them could become the first Hispanic woman to represent Texas in Congress. Rick Treviño, a former high school teacher from San Antonio, was unapologetic in aligning himself with U.S. Sen. Bernie Sanders, I-Vt., as the most progressive candidate. There’s no clear frontrunner in the race, but Hulings and Jones have easily broken from the pack from a fundraising standpoint, with Jones heading into the election homestretch with more than a 2-to-1 cash-on-hand advantage over Hulings. Raking in $282,000 in the first 45 days of 2018, Jones also raised more than three times what Hulings brought in over the same period and has picked up serious support from EMILY’s List, the influential national group that helps elect Democratic women who support abortion rights. Fundraising, several of the candidates pointed out, will be key to winning back the district. Hurd is increasingly well-positioned, facing minimal opposition in his primary with a $1.2 million war chest he’s amassed since his 2016 re-election. Hurd, who first claimed the seat in 2014, has since built a national profile as a rising star for the GOP. And after breaking with his party’s president, Donald Trump, on more than one occasion, recent Democratic- and Republican-aligned polling has put the incumbent’s popularity ahead of the president’s in the district, which went for Hillary Clinton in the 2016 presidential election. Acknowledging that TX-23 is home to a predominantly Hispanic population, the Democratic candidates mostly fell in line criticizing Hurd for a voting record on immigration they argue is not as independent as his image suggests. Spanning from San Antonio to El Paso and including hundreds of miles of the U.S.-Mexico border, CD-23 has long been considered one of the country’s most competitive districts. Republicans and Democrats have duked it out in general elections, but the district has not seen a competitive Democratic primary since 2012. Campaigning in the crowded primary has left candidates working to pull support from distinct arms of the Democratic Party. Most notably, Hulings has leaned on endorsements from the Congressional Hispanic Caucus, the moderate Blue Dog Democrats and his former law school classmates, Julián and Joaquin Castro. Jones is backed by former gubernatorial candidate Wendy Davis, veterans groups and LGBT groups. That support led to one of the few tense exchanges during the forum, when Villescaz questioned Jones about a campaign contribution from the LGBTQ Victory Fund and asked her to make that support and her sexual orientation clear to voters, particularly Catholic voters, so that it wouldn’t be “revealed later” as part of a Republican attack. Jones, who is an out lesbian and hasn't sought to hide her sexuality during her campaign, shot back that she was a proud member of the LGBT community.